Twelve years after graduating from high school, King enrolled in East Central College in August 2009. It wasn’t exactly easy to be a full-time mom and a full-time student, but she managed. It helped that she took most classes while her kids were in school, and it helped to have family nearby who could take care of the girls. She graduated from East Central in May 2012 with an associate’s degree in teaching. 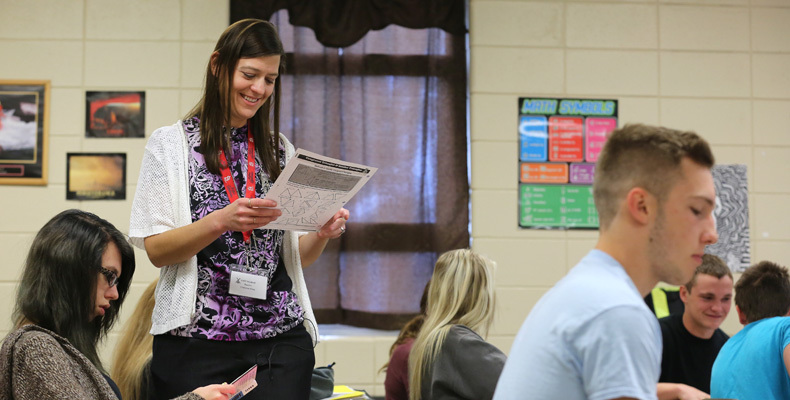 Before King got her degree, Dr. Jana Neiss, director of Missouri S&T’s Teacher Education Program, visited East Central and encouraged students to consider S&T. In January 2013, King enrolled at Missouri S&T. King didn’t bother to dip a toe in when she started at Missouri S&T. She jumped in with both feet. One of her first classes was Calculus III. “I thought I must be a glutton for punishment when I got here and was thrown into the upper-level classes,” King says with a laugh. But she thrived in the new environment. On a small campus, she made good friends — good friends who are nearly 20 years her junior. But from Euclid’s Elements to today, math has no age limits or requirements. “With math … I just love math,” King says. Soon she’ll pass along that love to high school or middle school math students. In the summer, King took Project Lead The Way pre-service teacher courses on Introduction to Engineering Design for high school teachers and Automation Robotics for middle school teachers. She’s hopeful that she’ll have a full-time job in the fall of 2016. Until then, King will substitute teach when the holiday break ends at schools in Owensville and Sullivan, Missouri. It’s all possible because she took a chance — on herself and on her future. Once she started, nothing was going to stand in her way. Your an amazing teacher with a HEART of gold! If you can help me understand the quadratic equation, you can train a new generation of Albert Einsteins! Congrats! Great Job Christina. I am happy for you. You made it. Congrats. What an inspiring story and video! Kudos to Christina and the Teacher Education Program here at S&T! Congratulations on graduating Christina! I will miss seeing you around campus!